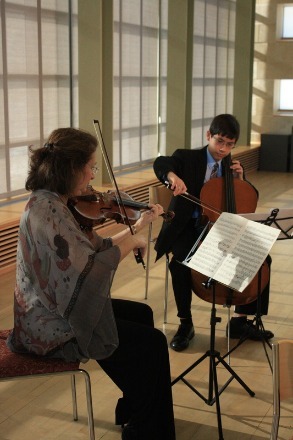 The Walden Chamber Players Young Artist Competition is held annually to promote and encourage young musicians from Massachusetts interested in the performance and study of chamber music. The winner will perform in a public concert with the Walden Chamber Players and receive a cash prize. Eligibility—The competition is open to any string or wind players who reside in Massachusetts and who have not yet graduated from high school as of May 14, 2016. Prize—The winner will perform with the Walden Chamber Players in a public concert in the fall of 2016 and will receive a $500 cash prize. The winner will be expected to perform the selected chamber work in its entirety. The cash prize will be awarded at the time of the performance. A runner-up will also be selected and will be asked to perform if the winner is unavailable. Winners may also be extended additional performance opportunities throughout the year. All decisions of the judges are final. • A. An unedited CD/DVD or digital (Youtube, Soundcloud) recording, under 10 minutes in length. Recordings will be evaluated by members of the Walden Chamber Players. • B. $40 application fee. Payable via online application (Paypal) or via check or money order made payable to Walden Chamber Players. Applications MUST BE SUBMITTED no later than May 7, 2016. All recordings should include 2 contrasting selections from the standard solo repertoire and should not exceed 10 minutes total length. These may be two separate works or contrasting movements of a larger work and selections may be shortened to stay within the time limit. Recording should be unedited. Recordings with accompaniment are encouraged but not required. Up to 10 applicants will be selected for the live semi-final round on May 30, 2014. Each contestant should prepare 2 contrasting selections from the standard solo repertoire. These may be two separate works or contrasting movements of a larger work and may differ from the selections on the application CD. All applicants MUST provide their own ACCOMPANIST for the semi-final round. Memorization is not required. Auditions will last 10 minutes. Finalists will be announced after all semi-final auditions are completed. Contestants who are not selected for the final round will receive audition comments in the mail. No more than 5 contestants will be advanced to the final round and asked to play the selected chamber work for their instrument (see below) with members of the Walden Chamber Players. This round will be open to the public. The winner and runner-up will be announced at the completion of the final round. Judges will provide written comments for all finalists. Jury—The Jury will consist of members of the Walden Chamber Players. The Walden Chamber Players Young Artist Competition is sponsored by donors like you! Please help us continue to provide this wonderful opportunity for young chamber musicians by donating today. “I felt so at home and overjoyed to be playing gorgeous music, surrounded by such receptive and supportive musicians. I don’t know of another competition that focuses on chamber music. It was a wonderful and educational experience!